I m a world traveller. I like nothing better than exploring new cites and countries and their culture. I am too old for camping and like my home comforts nowadays, but walking miles in a new place is still my favourite thing to do. Planes, ships, trains - I love them all, but mainly, it's the people who make travel so wonderful. Upmarket dining in a lovely setting. Staff are professional and attentive. Dishes are well presented and tasty. Excellent guides share the sad history of this gaol. Small groups are taken, so book before you get there. Clean washrooms and a decent cafe for tea and snacks. A definite must - see when in Dublin. Incredible history in the excellent display. Whatever else you may miss, don't miss this! Wished I could have studied there! Pedestrian street filled with good shopping both for tourists and locals. You will find whatever you need there, for sure. 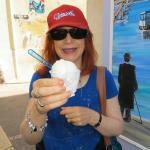 Have a gelato along the way!